Verdict: This is the best meatless sandwich I have ever eaten, and easily top five of all the sandwiches I have ever made. 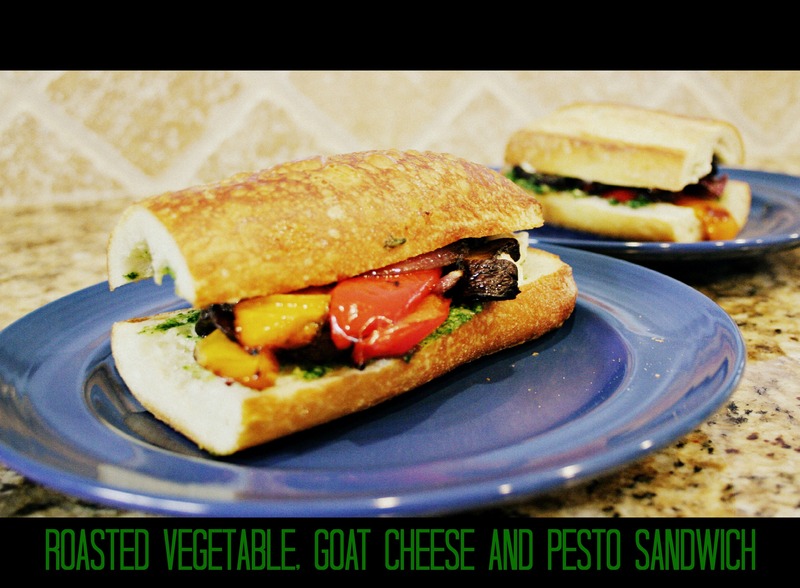 The kale pesto is so flavorful, the creamy goat cheese adds a tangy bite and the veg – seriously, this combination of ingredients is a match made in culinary heaven 😉 My husband would not touch this with a ten foot pole – it has the three out of four ingredients he refuses to eat. Oh well, more for me! My friend and I greedily/happily ate both of our sandwiches and can’t wait for the next time! I could have eaten this again for dinner…I may have a problem! 😉 Thanks for reading, enjoy! Preheat oven to 475. Line two baking sheets with foil. Gently wash the mushrooms and cut out the stem. Cut all vegetables in large pieces. In a large bowl, mix together oil, vinegar, salt, and pepper. Add the vegetables to the oil mixture and coat well. Place veggies in a single layer on the baking sheets, making sure each veggie touches the foil and is not on top of another vegetable. Place the vegetables in the oven. Roast for about 15 minutes, flipping the vegetables over at the 7 minute mark. They are ready to take out when the onions are starting to char on the edges and the peppers get nice blisters on the skin. While the vegetables are in the oven, cut your bread to the length that you want your sandwich. Slice in half and remove part of the inside to make room for the filling. 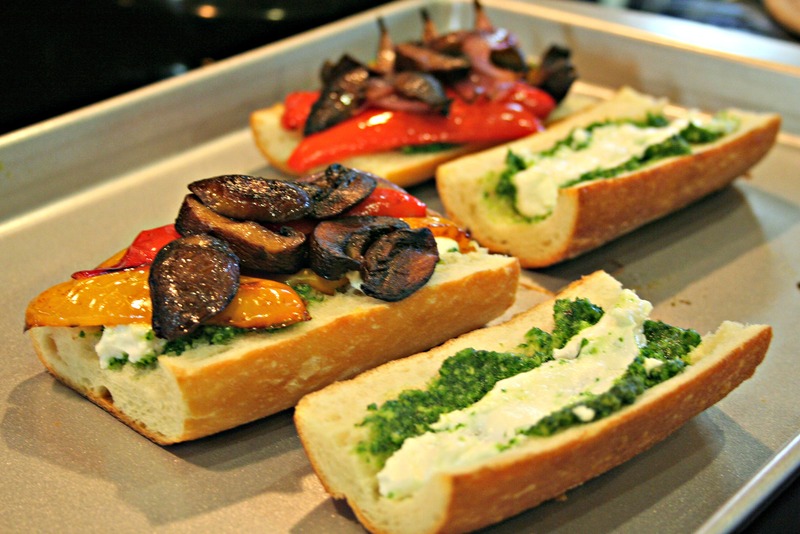 Spread 2-3T of pesto on one half of each sandwich. Then spread 1-2T of goat cheese on the other half of each sandwich. Remove the vegetables from the oven, and layer the vegetables in tidy layers over the bread. Close the sandwich up. Place on the baking sheets and put back in the oven to let the residual heat warm up the cheese for 5 minutes. Strange combination for this family, but I decided to try it. Grilled fruit is always a good idea, and I’m hoping these pears don’t disappoint! I recently started ordering produce from a local co-op and it’s been a great motivator to try new recipes. I never buy pears, and honestly wasn’t a huge fan – chalk it up to never eating them as a kid. I’m also hoping that the simplicity of the rest of the dish doesn’t equal lack of flavor…we will soon see. Verdict: All the components of this salad work together really well. They were all leery of the pear, but tried it anyway. I’m pleased with how it turned out, and most of my family (minus the pickiest eater), enjoyed this. Up next, the cheddar biscuits we ate with this salad! 🙂 Thanks for reading, enjoy! 1. Prepare the vinaigrette and place in the refrigerator for at least 30 minutes. 2. Butterfly each chicken breast or pound to an even thickness. Sprinkle with salt, pepper, onion powder, and garlic powder. 3. 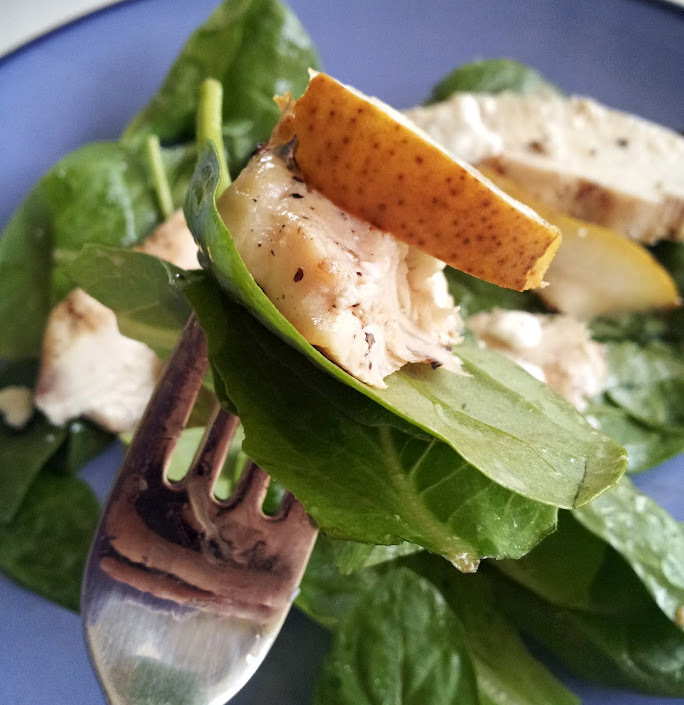 Grill chicken and pears until chicken juices run clear and pears and soft, warm, and slightly charred. 4. Remove chicken and pears from grill and slice chicken into strips. Quick Post: This photo is in no way a representation of its taste! I think bacon would have been a great addition to this, but sadly, M ate the last of the leftover bacon tonight. I added some cooked chicken instead which was a fine substitute – but bacon it isn’t! ;o) This meal came together fairly quickly and cooked up in the oven in 15 minutes. Thanks for reading, enjoy! Preheat oven to 350 degrees. Prepare a baking dish by covering it with aluminum foil. Whisk together the olive oil and balsamic vinegar in a small bowl. Brush the mixture on the aluminum foil and then brush the mixture on the tops and bottoms of the mushrooms caps. Sprinkle the caps with salt and pepper and then set them, gill side down, on the baking dish. Pour 1 tablespoon of the oil and vinegar mixture in a saucepan and saute the onion until it becomes translucent. Place baking dish in the oven and bake the caps for about 5 minutes. After 5 minutes, flip the mushroom caps and continue to bake for 5 minutes. Remove the mushroom caps from the oven. 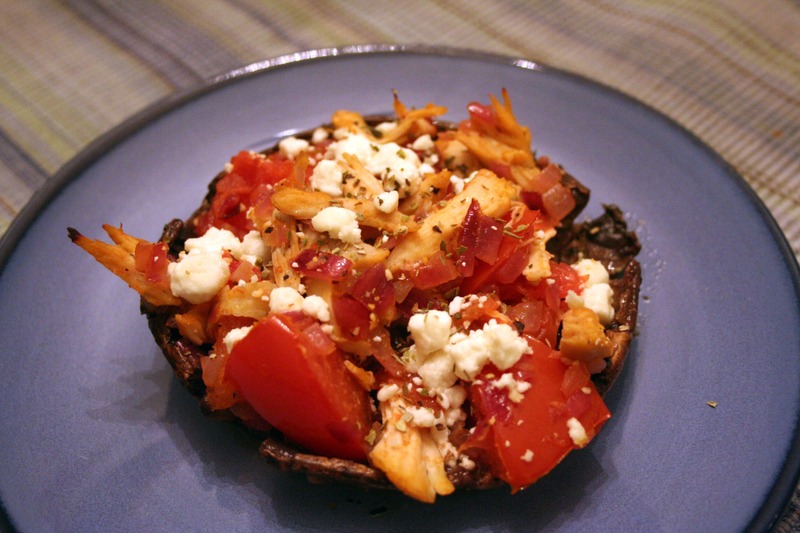 Fill each of the mushrooms caps with goat cheese, tomato, onion and bacon. Sprinkle with salt, pepper and basil. Place in the oven for 5 minutes and serve warm.